Today Facility Managers (FMs) and Building Service Contractors (BSCs) are developing strategic plans to build an environment that performs the functions for which the facility was originally designed, while providing better property asset management and a healthier workplace. To support these strategies, professionals are looking for ways to gain efficiency and productivity, reduce risks for accidents, while exploring eco-responsible and healthier cleaning processes. Unger’s innovative commercial cleaning tools, equipment and supplies were created with these goals top of mind and to help facility managers and building service contractors alike manage costs and add overall value, all through swifter, safer and greener cleaning processes. Dirty restrooms constitute the most frequent complaint among users of any facility, making it a top priority of facility managers and BSCs given the risk for cross contamination and the positive reputation of the facility. In most industries, restroom facilities receive a high volume of foot traffic which makes quickly and efficiently executing a deep clean a challenge - and priority - for custodial staff. Unger’s Restroom Rx is a cutting edge janitorial cleaning cart that offers multiple layers of value to your cleaning staff. Our patented clip system guarantees that all equipment is securely fastened to the cart and easily within reach. With cleaning staff able to comfortably and conveniently access their tools, they can eliminate any physical discomfort and quickly move on to the job at hand. An additional time-saving feature of the Restroom Rx is its storage module that significantly limits, or even eliminates, unnecessary trips back and forth to the supply closet for restocking. The narrow tool tower feature ensures that all tools and equipment remain inside the width of the cart, guaranteeing convenience for cleaning staff and safety of facility occupants passing by. 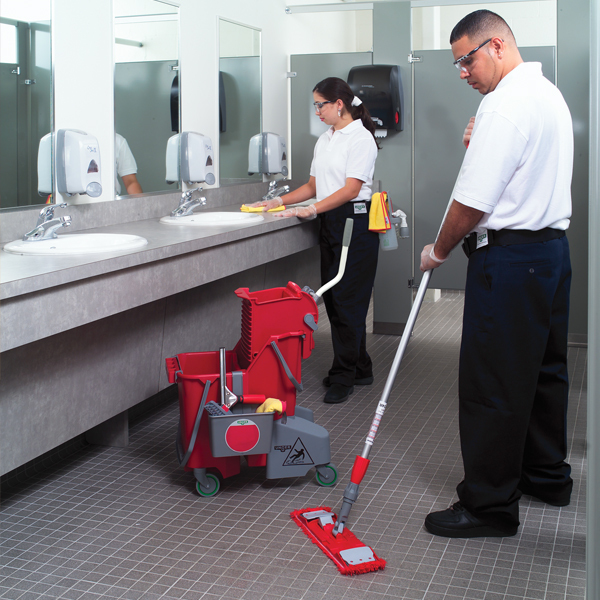 While staff can quickly and safely perform their restroom cleaning duties, Unger’s color-coded microfiber mops and the dual bucket system take on the challenge of limiting the risk of cross contamination. Microfiber mops clean floors more thoroughly than traditional cotton-based mopping systems that can leave behind unseen bacteria and debris. And the dual bucket system allows staff to keep clean and dirty water separate, maximizing use of the cleaning solution and drastically reducing the risk of re-contamination, leaving facility occupants with cleaner and healthier restrooms. Cleaning outdoor windows can be one of the riskiest and most time-consuming aspects of facility management considering the equipment typically needed to execute the job. And given the perceived complexity of undertaking this job, and the level of training staff need to perform the task safely, outdoor window cleaning is often times one of the first areas for outsourcing consideration. However, Unger’s HydroPower™ professional window cleaning equipment not only allows you to keep outdoor window cleaning in house and avoid the expense of outsourcing, it offers a huge boost in cleaning speed and efficiency over traditional window washing systems. Combined with our nLite technologies, the HydroPower pure water cleaning system empowers cleaning staff with the ability to clean up to 5 stories high without the use of ladders or lifts. With their feet planted firmly on the ground, your staff achieves a streak-free clean in single step, with less OSHA liabilities. Inside your facility, Unger’s Stingray window and glass cleaner provides a faster and healthier clean, slashing cleaning time by 25% and chemical use by 39%. Your staff can complete the task with a reduced chance of stress injuries from repetitive use while achieving a streak-free clean every time. Rafters, pipes, ceiling fans, light fixtures and other high access surfaces can easily accumulate dust and go unnoticed, but just because you’re not seeing it doesn’t mean it’s not impacting the environmental health of your facility. To make high access cleaning and dusting a more frequent and successful task, Unger provides a huge selection of cleaning tools to keep your staff safe while allowing them to quickly execute the task at hand. Unger’s color-coded line of microfiber cloths and ergonomically designed Sprayer on a Belt work to instantly cleanse surfaces of dust, germs, soil particles and other contagions that traditional materials would leave behind. They also require fewer harsh chemicals, reducing chemical exposure and supporting positive outcomes. 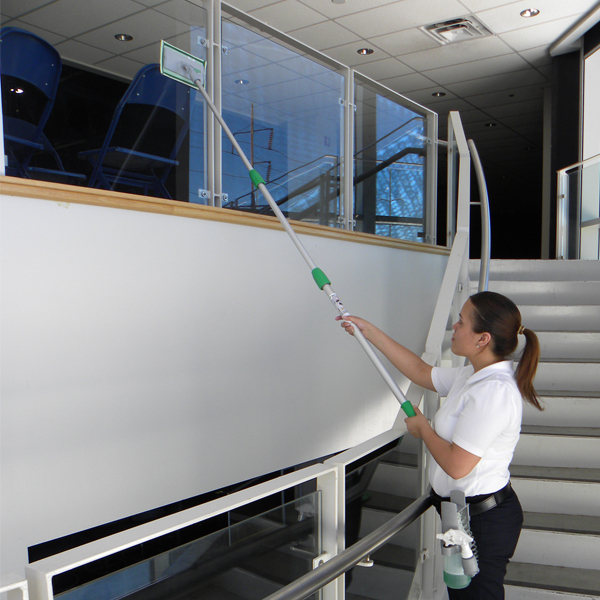 For those hard to reach areas, our array of dusters, brushers and pads, combined with our Aluminum Telescopic Poles, allows cleaning staff to easily reach trouble areas without the use of ladders or lifts. By making high access cleaning easier and safer, staff can more frequently perform these tasks that go a long way in reflecting your facility’s commitment to providing the best environment, whether it’s for working, living, visiting or enjoyment. Lighting maintenance needs are met with Unger’s line of bulb changers designed for safe, precision light bulb replacement. With the products’ insulated designs and long pole handles, custodial staff stays safely away from the heat without the use of dangerous ladders and lifts. 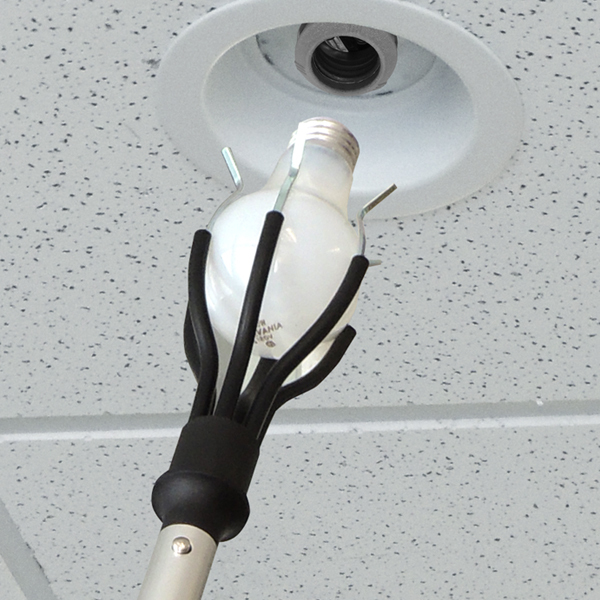 Change a variety of lightbulb sizes quickly and easily with Unger’s high access light bulb changing supplies. For some facilities it may be a commercial kitchen, for others it may be a smaller scale kitchen and break room for occupants to enjoy. When food debris, liquids and grease accumulate on the floor, the increase of slip-and-fall accidents increase. To minimize the risk of floor related injuries to facility occupants, Unger offers its cutting edge microfiber string mop system. With a wider spread than traditional mop heads, our mops allow workers to clean a larger area, faster. In a fast paced kitchen or highly trafficked break room, quickly addressing debris and spills can make or break the productivity and enjoyment of your building’s occupants. Our color coded mops, when combined with our dual bucket floor washing system, leave floors cleaner and safer by isolating dirt and maximizing usage of the cleaning solution. 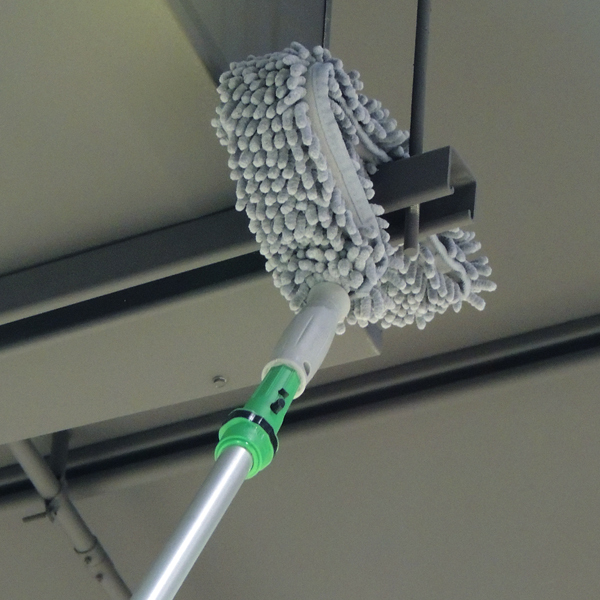 By color coding your mops for each cleaning zone in your facility, you can better prevent cross contamination and implement a highly efficient cleaning process. 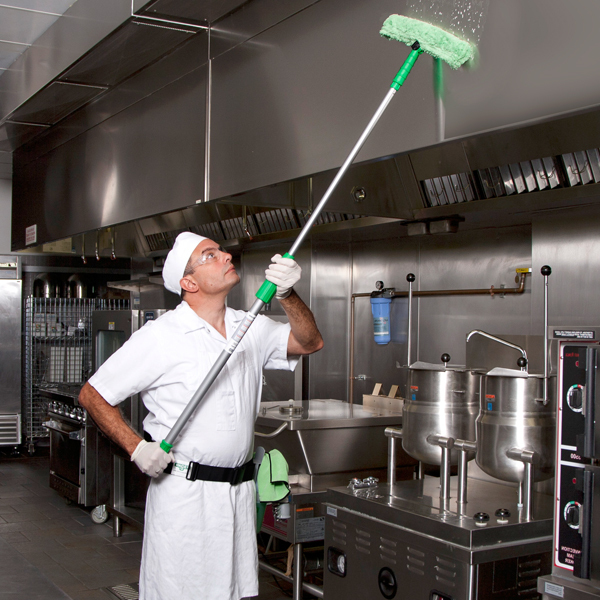 For commercial kitchen cleaning, Unger’s food service cleaning tools include high heat grill squeegees and double-sided scrapers to help maintain pristine cooking surfaces. Complemented by our extendable poles, kitchen staff can hand clean kitchen hoods and perform high access cleaning to insure the kitchen adheres to the highest cleaning and safety regulations. 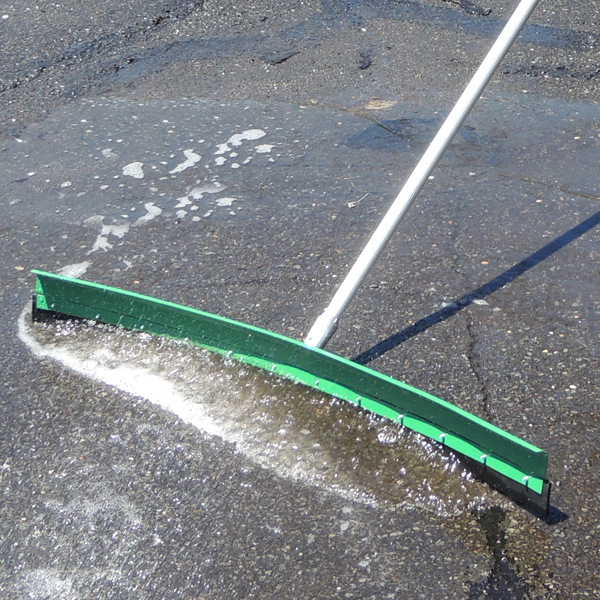 Unger’s AquaDozer industrial floor squeegee makes quick work of water, snow, trash and construction debris removal, as well as more difficult materials associated with larger disaster clean-up efforts. Engineered to move up to twice as much as competing models with its specially designed curved blade, the AquaDozer Max makes it easier to move water, slush and debris from high traffic areas. 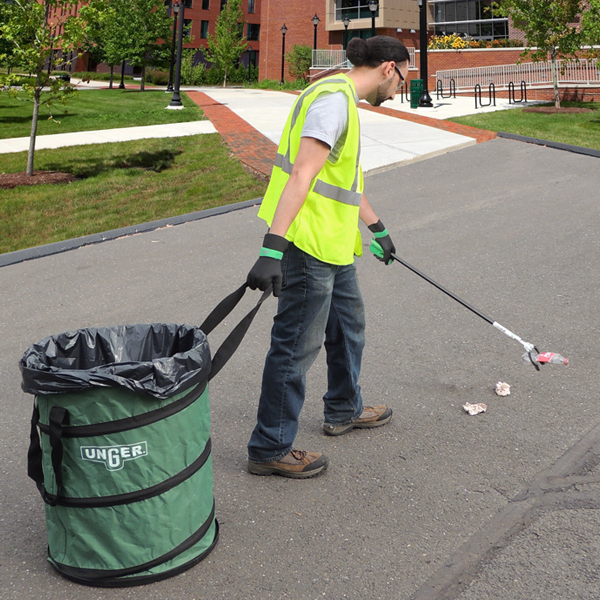 For smaller litter removal jobs on sidewalks, parking lots and other public areas, Unger's line of litter removal tools help cleaning staff safely and efficiently retrieve objects high and low. The lightweight aluminum shaft of our NiftyNabber trash picker helps custodial staff stay comfortable by minimizing strain and ultimately reducing the risk of injury. Ergonomic handles and lightweight design combine to help keep your grounds spotless and staff healthy as they quickly clear debris. Unger goes beyond getting the job done for your facility, innovating to become a true partner in building highly effective, sustainable cleaning initiatives that keep your facilities cleaner and healthier, and your staff and occupants safer. 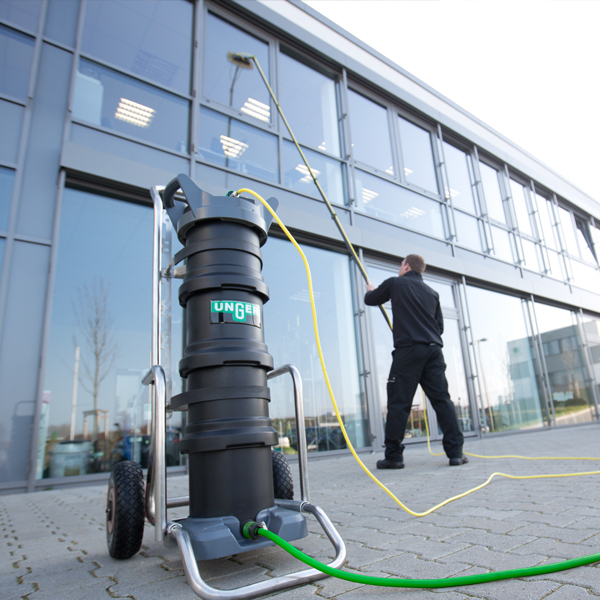 Whether it’s our avid insistence on avoiding cross contamination with our color-coded systems, or our award-winning window cleaning equipment, Unger brings you a swift, safe and green way of cleaning that supports your facility management strategy.